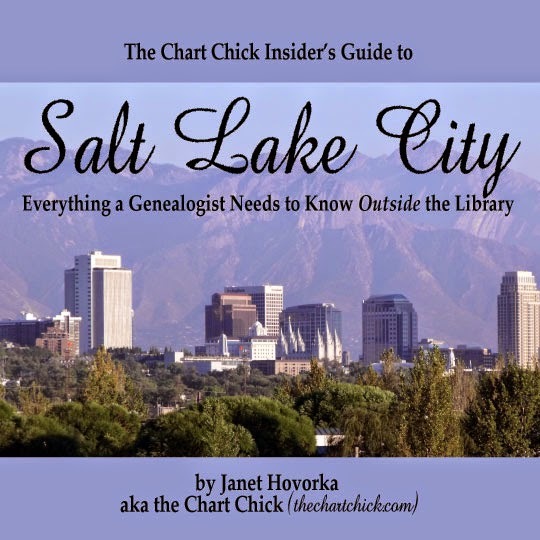 The Chart Chick: Chart Chick Insider's Guide to Salt Lake City--Updated! Chart Chick Insider's Guide to Salt Lake City--Updated! A couple of years ago, my friend Thomas MacEntee, encouraged me to put together a local's guide to Salt Lake City. Seeing as Salt Lake City is the Genealogy Mecca, eventually most folks researching their family history end up here. Either for conferences or to spend a few days in the Family History Library, it's kind of the place to be. I have spent a good deal of my life here in Utah and I really love it. Some genealogists choose to live in Salt Lake City because of all of the great genealogical resources, but I love it for many reasons beyond that great perk. First and foremost, you cannot beat the scenery. The mountain vistas are breathtaking. And I love the clean lifestyle here too. Clean streets, air, and water. It very fresh and refreshing to be a resident here with wonderful access to all of nature's grand showcases. You also cannot beat the people. Hands down, Utah is one of the friendliest places I have ever lived. In fact, at the 2002 Olympics, people from all over the world marveled at the friendly and helpful nature of Utah's locals. Even a few years ago, on one of the American Idol search tours, the judges were bowled over by the friendly nature of our residents. American Idol did a montage of over a dozen hopeful contestants saying "thank you" for the opportunity to be rejected (and the actual rejection itself). At one point, I think it was Paula Abdul who made a comment to the general effect of "What's in the water and can I get some of it?" Which, while completely hilarious, I can assure you: people really are just that nice around here. And I love it! Hopefully in your travels out our way, you get to experience that welcome attitude. Don't be afraid to strike up a conversation while you are out and about--you'll make a new friend in no time flat. I just really love it here. And I want you to enjoy yourself when you come and visit. So for that reason I wanted to make sure you have the insider track on the best visit possible. There is nothing worse than hitting a new town and not knowing where to stay or eat or play. Problem solved. So with the opening of the APG Professional Management Conference today, and with the Salt Lake Institute of Genealogy starting next week, and with RootsTech just around the corner, I thought now would be the time to update my Salt Lake Guide. If you are planning a trip to Salt Lake City any time soon, be sure to download Family ChartMasters's free Salt Lake City travel guide. I have included over 150 links to the best places to stay and eat, sights to see, shopping guides, genealogical and library resources, transportation options, and more. The .pdf is twenty three pages of great information all geared to the genealogist's experience. And you can purchase a hard copy to pick up at our booth at RootsTech (or be shipped to you). It's newly updated with all of the best spots and their information. And did I mention it's free? A city guide, from a local, with tried and true resources. You honestly can't beat it. And once you download it and try out a few of my suggestions, be sure to let me know what you think. Received the email with the link, but the link didn't work. So sorry about that, Randy! Ever have one of those days? Link is updated, working, and live (and sent in a second email). Thanks for the heads up and please let us know if there are any more glitches on our side. Thanks! Thank you so much for updating this document and commenting on my blog! Will make a point of stopping in to see you when I'm in Salt Lake City next month! You are very welcome! We look forward to seeing you at the booth! Thanks for the Salt Lake City guide! Thanks, Jana! I appreciate you sharing my post.